This large nesting doll features the trail of OJ Simpson. The largest doll is OJ Simpson and is 8” tall. He holds a golf club and wears the famous glove. In his pocket is a card reading Hertz (the rental car that he did ads for). Around the base of the doll are OJ’s prisoner number BK 4013970 and the date 06-17-94 when he surrendered to police after the famous slow speed car chase. 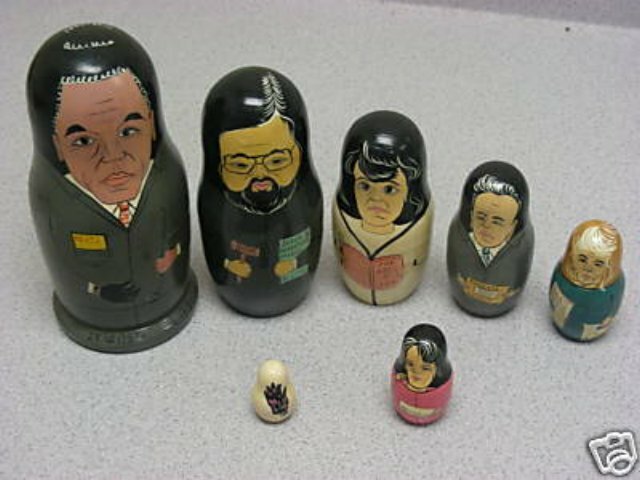 Dolls include: OJ Simpson, Judge Lance Ito, Marsha Clark, Robert Shapiro, Kato Kaitlin, Rosa Lopez, and the Glove! !